The Bike Rib 2.0 bike rack is designed for use in securing two bikes and is efficient, familiar and dependable. 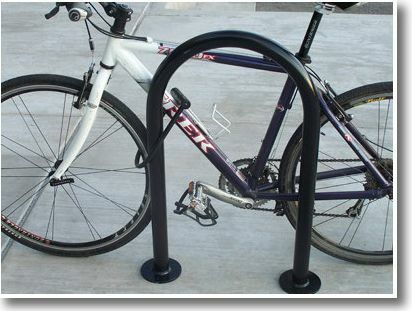 with a highly-secure U-Lock while facilitating organized bike parking. The Bike Rib provides optimum flexibility in site orientation. It can be placed side by side, end to end, at an angle or alone. The Bike Rib is available with either surface mount or in-ground mounting options.